Make your plans to come on out this Saturday for Lafayette's second annual Bicycle Safety Festival! 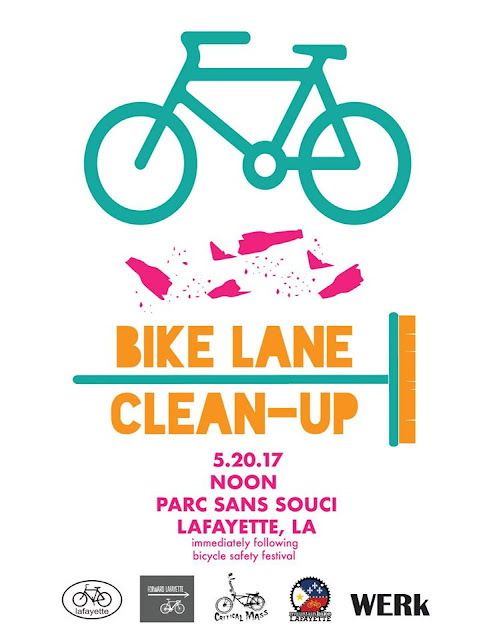 Last year, the festival was held the first Saturday in June (right before a mega-rainstorm, I remember), but this year, it's happening during National Bike Month at Parc Sans Souci in Downtown Lafayette. From 9am to noon, there will be free bike registration, a bike safety course, helmet giveaways, bike lights, food, drinks and live music. The festival is free to attend, and great for families, especially when you can pick up a bike helmet and register your bike for free. And this year, starting at noon, there will be a bike lane cleanup, although I'm not exactly sure which bike lanes will be canvassed. Lafayette's bike lanes definitely tend to be a catch-all for litter and other road debris, and Mountain Bike Lafayette is gathering volunteers willing to help pick up trash and sweep debris from the bike lanes so that they can be better enjoyed. These events are a great way to celebrate National Bike Month and get involved in the local bicycling community. 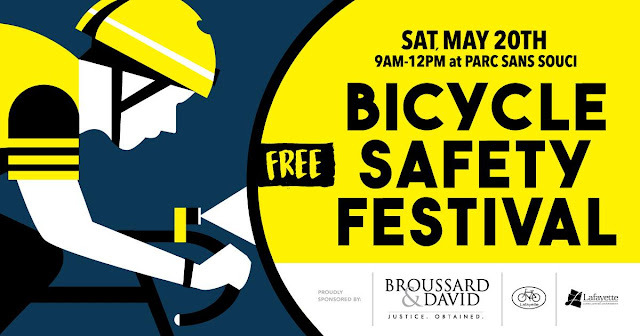 I had a great time volunteering at last year's festival, and although this year I may just be a visitor, I encourage you to stop by and learn a little about bicycle safety!